Mezzo-Soprano Laurie Rubin will perform a program of works by Mozart, Rodrigo, Gershwin, Sondheim, Schwartz, and Sivan among others on February 28th at Zipper Concert Hall, at the Colburn School of Music in Los Angeles, CA. Ticket sales are 100% tax deductible, as all proceeds will be donated to the Israel Guide Dog Center for the Blind. Blind since birth, mezzo-soprano Laurie Rubin recently received high praise from The New York Times chief classical music critic Anthony Tommasini, who wrote she possesses "compelling artistry," "communicative power," and that her voice displays "earthy, rich and poignant qualities." Recent career highlights include her UK solo recital debut performance at Wigmore Hall in London as well as her solo recital debut at Weill Recital Hall at Carnegie Hall. 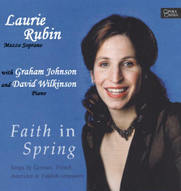 Ms. Rubin has performed concerts of new music with the Chamber Music Society of Lincoln Center, and has performed numerous roles, including the lead role of Karen in "The Rat Land" by Gordon Beeferman with New York City Opera, Penelope in Monteverdi's "The Return of Ulysses", and the title role in Rossini's "La Cenerentola." She has recorded a CD of art songs with renowned collaborative pianists Graham Johnson and David Wilkinson on the Opera Omnia label. Have you heard about the first modern dance company school to integrate professional stand-up and sit-down (wheelchair) dancers? The talented and professional group of performers at Dancing Wheels have an active touring schedule in locations around the US. Mary Verdi-Fletcher, President and Founding Artistic Director, a pioneer in the field of integrated dance, started the company in 1980, and for more than a quarter of a century, Dancing Wheels has performed, taught and inspired children and adults of all abilities around the world. In the U.S, the company presents more than 100 performances reaching audiences of 125,000 each year. For the upcoming season, Dancing Wheels has just announced that legendary choreographer Donald McKayle has been commissioned to create a new work for the Company! Professor McKayle has chosen a piece from Duke Ellington's Far East Suites, and will be in residence at Dancing Wheels for three weeks in November, to begin work with the dance ensemble for a May 2010 performance. View the website at www.dancingwheels.org for more information, photos, and the schedule of performances. For information about touring, or if you wish to book a performance: touring@dancingwheels.org. To contact President/Founding Artistic Director Mary Verdi-Fletcher: mary@dancingwheels.org, For issues regarding grants, communications, and development, contact Dana Kuhn at dana@dancingwheels.org. For general inquiries or comments, e-mail info@dancingwheels.org or to reach the School of Dancing Wheels, e-mail: school@dancingwheels.org. "Outside the Box/Performing Disability" is an international showcase featuring provocative, exotic and cutting-edge disabled performers. There has been a seismic shift in disability arts over the last decade, both in form and content. Using unique configurations of body, voice and mind, disabled artists are constructing new art and new art forms. Mat Fraser, internationally known actor and playwright (Sealboy: Freak, Thalidomide: The Musical) will emcee. Fraser was most recently featured as Puck inThe Kaos Dream, a revisioning of Shakespeare's A Midsummer Night's Dream, which toured Britain last fall, where it enjoyed rave reviews, sold out audiences, complaints from Catholic School teachers and standing ovations. Tickets: $18. Available online and at the door. Go to http://www.disstudies.org/conference/2008/events/nyu to reserve yours! Event presented with Sign Language Interpretation, Audio Description and Open Captioning. Space is Wheelchair Accessible. Assistive Listening Devices, Large Print & Braille Programs Available Upon Request. Danny Murphy Stars in "The History of Bowling"
Please come and see me in a great co starring role in this quirky romantic comedy that turns disability stereotypes upside down. This unique theatre piece is getting a lot of attention and will change the way you see disability for sure. Place your order now at 818.508.7101 ext 211. For more info go to www.performerswithdisabilities.com. And please...help spread the word! The History of Bowling is the inaugural play for Blue Zone Productions, a theatre company dedicated to producing professional, quality theatre that nurtures and promotes artists with disabilities. Set on a college campus on the East Coast, The History of Bowling is a hilarious romantic comedy between a quadriplegic and epileptic student who are forced to write a PE term paper together because they can't physically participate in the class.